Jessica Biel's curly hairstyle is a good choice for fine-haired girls. Steal her style:1. Part your hair down the middle. Put a dollop of smoothing cream on your palms and run them over your dry hair.2. Use a 2-inch curling iron to curl the bottom half of your hair. Don't separate or comb through your curls at all. 3. Mist each section of curls with flexible-hold hairspray. 1. Apply a smoothing cream and blow dry hair straight using a round brush. 2. Put some styling wax on your fingers and run it through your ends to get a piece-y look. Nicky Hilton's straight and silky half updo works well for day and nighttime events. What to do: 1. To get the look, apply a straightening serum to damp hair and section off hair with clips. 2. Next, with a round brush, dry in 2-inch sections. Pull the brush gently through the hair and twist the brush under slightly at the end so the tips don't look severely straight. 3. When your hair is completely dry, apply a shine serum, making sure it's applied throughout the hair. 4. Next, take about four inches of hair at your forehead and pull it forward. Then, with a teasing comb, lightly tease the hair at your crown -- more teasing equals more height. 5. Then lay the front hair over the teased section, making sure it's pulled straight and sleek (you want it to be fly-away free) and secure in the back of the crown with a few bobby pins.6. Finish off the look with a holding spray, making sure to get the bouffant, and the rest of your hair, too. Michelle Williams gets her bohemian on with this braided bun. To steal her style: 1. Start with wavy, blow dried hair. (Sleep in braids if your hair is straight, then undo.)2. Tease roots at the crown and spray with volumizer for lift. 3. Leaving out front section (including bangs and strands that will frame your face), loosely braid one side of your hair back toward the nape of your neck and secure with an elastic -- any kind.4. Repeat on the other side.5. Join the braids and wrap them into a bun, tucking ends under to hide the elastics. Pin into place. (If your hair isn't long enough to make a bun, cross the ends up and into the opposite braid, the pin them so the ends are hidden. Set with hairspray. Michelle Pfeiffer's layered cut makes a chic, soft hairstyle that's especially good for balancing a wide face shape. To get the look: 1. Spray leave-in conditioner all over hair, and part it down the middle. The conditioner will help protect hair from heat and other styling products.2. Use a large round brush and dry 3-inch sections of hair under (with brush under the section of hair you're drying). Pay special attention to the sides and roots of hair, where you want a little extra volume.3. Put a small amount of hair wax on your fingers and direct the front layers of hair to frame your face. Set the look with a medium-hold hairspray. Kristin Cavallari's layered look gives off a sweet, yet flirty, impression. Steal her style: 1. To get the look, apply styling cream and blow dry hair, flipping out your shorter layers with a round brush.2. Use a curling iron on your longer layers to create a more dimensional look.3. Finish with a shine serum or spray. Kirsten Dunst's slick pixie works best for fine hair -- if hair is too thick or textured, it'll stick up like a Chia Pet. To get her look: 1. Use a fine-tooth comb to style hair while it's wet and clean. Then while it's still wet, rake it with your fingers to create some chunky texture. Air dry.2. When it's totally dry, add grooming cream (a pea size at a time) and style it into a chic, side-slicked look, bangs included. 3. To finish, spray your fingertips with hairspray and glide them along your bangs to help keep them in place. Kim Cattrall's shoulder-length hairstyle can be enhanced with flirty sideswept bangs. Tips to get her look: 1. To start, blow dry hair straight with a round brush.2. Curl the ends slightly with a large-barreled curling iron. Put large sections of hair in the iron so you get loose waves, not ringlets. 3. Blow dry your bangs, sweeping them to the side.4. Mist with finishing spray to ward off any frizz. 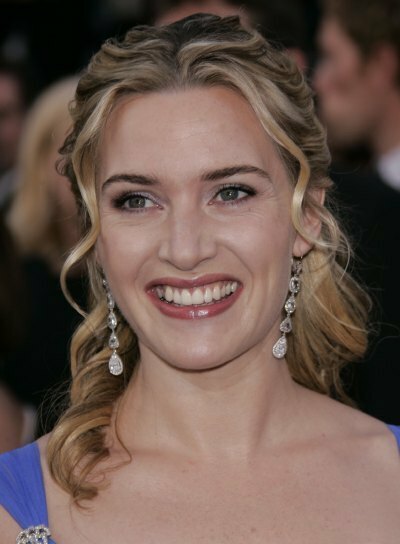 Kate Winslet's wedding- and prom-friendly half updo is super flattering for almost anyone, without looking too young or old. Steal her style: 1. If your hair is too short, get some extensions to help you fake this 'do (your hair should be at least six inches long, though).2. Work styling lotion through slightly damp hair, comb through and set your entire head with pin curls. Do this by wrapping sections of hair around your finger and then pin them to your scalp. (You can also use hot rollers on dry hair.)3. Release and finger-comb waves.4. Touch any curls up with a curling iron if needed. Pull the top section of hair back and pin into place, leave a face-framing piece on each side of your head. 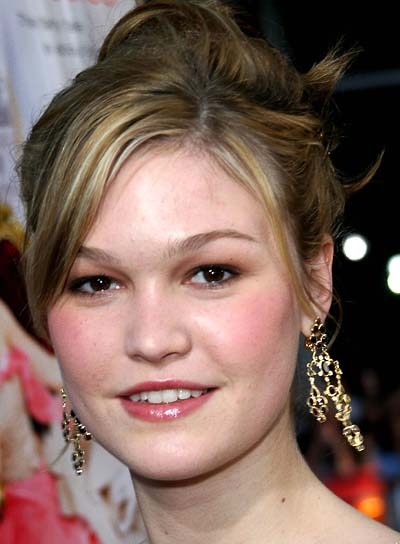 Julia Stiles' uber-casual updo would be great for a casual get-together. Steal her style:1. Blow dry damp hair straight using a paddle brush.2. Tease the hair at the crown for a little extra volume.3. Pull back hair into a French twist by twisting all your hair to the right while pulling the ends of your hair up toward the ceiling and pinning in place. The messier the better in this step.4. Loop ends over and tuck into French twist, pinning in place and use a bit of spray shine to glam it up a bit. Jewel's long, blonde hair look is pretty for a night out, especially if you have layers. Steal her style: 1. You're going to want straight hair, so if it's curly or wavy, apply a smoothing serum to damp hair, and blow dry straight with a paddle brush.2. To amp it up a notch, go over your hair with a straightener -- we're talking really straight here.3. Then, take a comb and create a side part, almost to the back of your crown.4. Next, take a teasing comb and tease your hair, and once the height's to your liking, smooth over the top layer. 5. Just spritz with a light-hold hairspray and you're done. Ashlee Simpson's face-framing fringe acts like little arrows that point to her beautiful eyes and cheekbones. Get her look: 1. Apply volumizing mousse to damp hair and blow dry using a large round brush.2. Blow dry til it's 100 percent dry -- that's the key to silky straightness (no laziness allowed). 3. Hit the ends with a flat iron. 4. Mist your bangs with flexible-hold hairspray, then finger comb 'em to break them up. 5. To finish, rub a drop of shine serum in your palms and run them over the ends. Ashlee Simpson's romantic waves are beautiful for clubbing or a dressy event. See what to do here: 1. Start with clean, dry, straight hair. (Blow it straight if needed but no flat-ironing.)2. Mist with heat-protective spray and curl hair in 1-inch sections, using a 1-inch curling iron.3. When curls are cool, run a dab of styling cream between your palms and twirl a large section of hair (like a 4-incher) from top to bottom several times. Pull the section downward as you go, to relax the curl. 4. When all your hair is done being twirled (a key step to looking more mermaid-y than "curling ironed") flip your head and give it a good shake to release the waves. Ashlee Simpson's flowy hair is gorgeous on ultra long hair (natural or via extensions) or on medium hair. See how to do it: 1. Distribute two palmfuls of mousse through damp hair with a vent brush.2. Blow dry using your hands. Use them to twirl the ends and coax them into the bendy look. 3. When dry, roll 2-inch sections along a large-barrel curling iron. Only curl hair from chin-level down.4. When hair's cool, rub a pea-size dab of styling cream in your hands and run them down a large section of hair over and over to pull the curl out and coax it into broken waves. Repeat til all your ends are done.